This article has been extracted from the book, Future of God Amen. As the father of four beautiful, personal, intelligent girls, I wrote about a subject that has been a curiosity of mine since I was a little boy; who was God and where did He come from? My curiosity prompted me to attend Catholic, Methodists, Baptists, Protestant, and Jewish houses of worship. After serving a few years in the Army, I read books by philosophers, religious scholars, and highly respected Egyptologists. Late in life, that is, upon retiring at the age of 67, I wrote my first book titled, Legacy of a Father. My attempt was to have my girls remember their father after I am dead by preserving my thoughts and ideas in a book. But I present this article to you, to better understand me. It is my desire to reach out to all people to reveal the truth on such subjects as religion, God, the universe, and our purpose in life. It would be derelict of me not to reveal the truths I have learned by what I have read and by the exchange of ideas with the many people that have entered my life. Truth can be elusive and may take many years to comprehend based upon real life experiences. In my reading I have come upon truths by accident and, in many cases, by simply connecting the dots through the application of common sense. It would be a foolish gamble to wait for somebody else to present the findings I have acquired in my lifetime. Our lives are made up of too many different events that shape our thoughts. Be they on an educational, social and personal level, these events combined with our intellect and sensitivity will always present a different color of the way each of us see, interpret life, and develop our thoughts for others to hear or read. This spiritual element I allude to may simply be love for mankind. However you may conceive your God, you may be assured that He would rather have you love the people around you than to focus your love on Him. My responsibility as a father is to educate and prepare my daughters to make their own way in life. They need not bow down to me, prostrate themselves in a submissive manner, and humble themselves as if I were a God. They need only to respect me for the love and precious time I have invested to help direct their lives so that they may tap their potential and become strong individuals who can stand on their own two feet. God may be present, but He cannot do what I and my wife, as father and mother, can do for them. That is, to have them carry on the legacy of raising wonderful children in this world. As mere mortals, we may never be able to know the whole truth about God. We have had our share of prophets and righteous men who endeavored to show their fellow beings how they can lead moral lives. We shall see in the forthcoming chapters that some have made mistakes in their zeal to impart knowledge about God. We should not fault them for trying to have us inherit a belief and way of life received through their revelations. Only by consistently trying to seek the truth, will we be able to have a clearer understanding of the lives we lead and, a more positive and healthy outlook for the future. Future of God Amen was not written to deceive my children and my readers. You will find that every conclusion and assertion made has been grounded in facts and references that have come from reliable sources. I will not waste my time on gobbledegook to prove a point. It is love for the truth that gives me the stamina to share my research efforts with you. There is no other agenda in this book than to open your eyes, widen your perceptions, and bring you closer to understanding yourselves and the God in which you believe. 1 God may be your own personal god that is not bound to a particular religious faith. God is therefore not conceived in the same way by each person and is formed by one’s own sensibilities, intellect, acquired beliefs and knowledge. 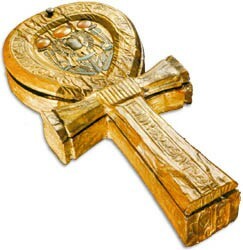 The ankh is featured to inform people that it is the symbol of the greatest attribute revered by the Egyptians – Truth. The Pharaoh and his top advisors were indoctrinated to use truth as the basis to settle disputes and serve justice. Both “Future of God Amen” and “AMEN” provide a comprehensive history why the attribute of Truth was a prime attribute of their God, Amen. These books reveal that Amen existed before Moses walked out of Egypt. But have believers been taught that the major religions originated with the beliefs of the Egyptians?